The issue of energy is crucial for the future of the European Union and its population. The scientific community and the public are discussing many problems: the utility of so-called renewable, the looking for new sources of energy that could change the global balance, the need to promote sustainable development and to ensure the safety of citizens, the geopolitical consequences that energy brings. 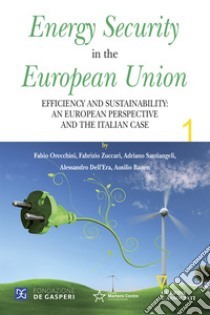 Italy and Europe are at the forefront of many of these issues, and this text is hoping to make a useful contribution in respect of some of them, offering case studies and reflections of some leading researchers and intellectuals.De Gasperi Foundation was founded in 1982 to promote the vision and the example of Alcide De Gasperi, the founding father of Italy and the European Union. The Foundation aims to contribute - through its cultural activity – to the democratic growth of the European Union, given that the process of european integration represents a great choice to embark on a new period of prosperity.